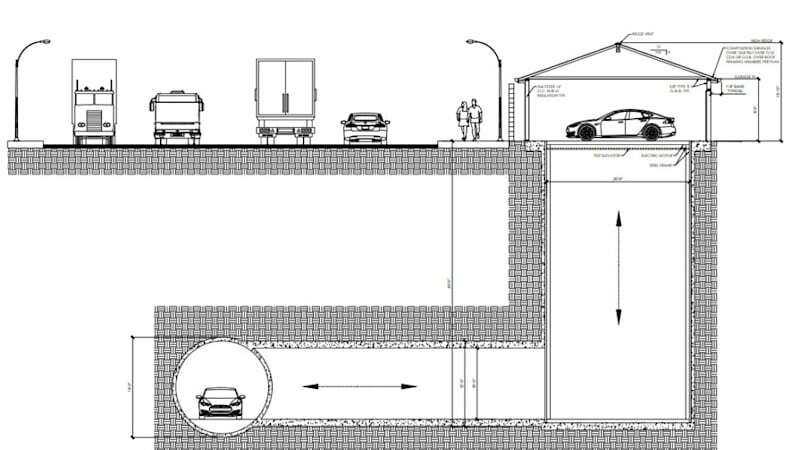 Elon Musk's Boring Company just received approval to build a tunnel entrance connected to a residential garage in Hawthorne, CA, according to a city council filing found by The Mercury News. The goal here would be to allow people to get their cars from their garage right into one of the Boring Company's test tunnels so they can drive it near their destination once they arrive. The filing gives permission to dig a vertical shaft in a residential garage that would connect to an underground test tunnel. That tunnel would lead back to SpaceX's headquarters. Cars could be lowered down from the garage on an elevator inside the shaft, then loaded onto an electric "skate" to be transported at high speed. Traffic reduction is one of the Boring Company's goals. A vast network of these things would mean people would be driving far fewer miles in their cars, because it would only require a short trip once they get out of the underground tunnel. It's smart to maintain a fair bit of skepticism on this one. The cost to install such a system in a personal home would surely be astronomical. But then again, prices for everything are astronomical around Los Angeles and San Francisco. 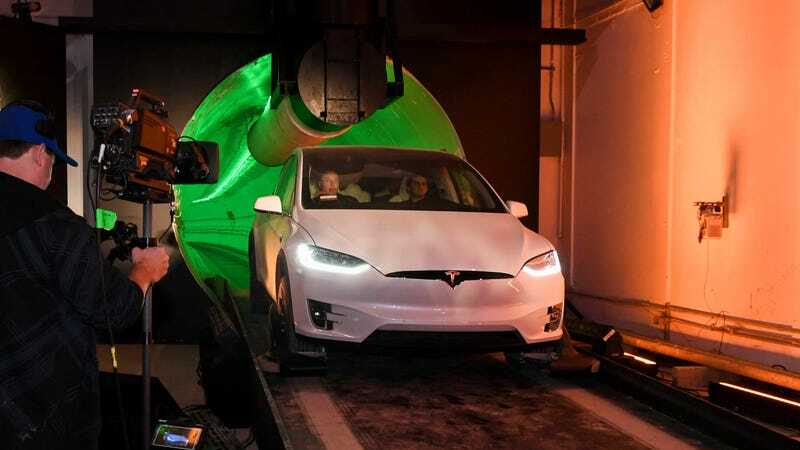 There are clearly still a lot of hurdles for Musk and his company, because large-scale application of the the envisioned tunnel system would be a huge task. This new addition to the project is interesting, though, and would probably be happily accepted in the unbearable traffic hellscape that Southern California is. Elon Musk also tweeted that the Boring Company would open a brick store within the coming months, selling bricks at $0.10 apiece, or free to affordable housing projects. The Boring Company's FAQ page states that the company is "investigating technologies that will recycle the earth [bored from tunnels] into useful bricks to be used to build structures." The company is even looking for a "knight to yell insults at people in a French accent" from Boring Co's own watchtower in LA. Elon Musk has reaffirmed his promise to offer DIY construction kits composed of dirt bricks. The company will start with a "whole product line of DIY watchtowers." The bricks will be pressed from dirt and rock, the spoils of tunneling operations that would otherwise require costly disposal. Job listings currently include a Watchtower Guard that will be stationed at Boring Co's own watchtower at its Hawthorne, California, demonstration tunnel for a few days, evoking Monty Python and the Holy Grail. "The Boring Company is building a watchtower in LA out of dirt bricks & we need a knight to yell insults at people in a French accent," Musk says. The executive previously hinted at more sets replicating ancient Egypt's pyramids, Sphinx, and other temples. When you’re that rich and have that much time on your hands I guess it’s just natural to start hypothesizing about how to get a car from the surface, to below the surface, and then back to the surface for no reason. At the behest of their board, who apparently didn’t want to discuss billion-dollar train tunnels without exploring other options, top Virginia transportation officials went to California to ride in The Boring Company’s silly car tunnel. See, as the Virginia Mercury reports, the Commonwealth Transportation Board has been discussing improvements to the state’s rail infrastructure, including a $1.3 billion bridge between Virginia and Washington D.C. At the same time, they wondered—would those improvements be pointless if Musk’s tunnel system became the Next Big Thing. Again, these officials are doing nothing more than simply reporting back to the board, in the blandest possible manner, what The Boring Company has built. Merely reciting basic facts makes it sound no better, and in many ways significantly worse, than what already exists. It’s almost as if the entire theory of The Boring Company is to assume away all the actually expensive and time-consuming parts of major public works projects like environmental reviews and labor costs. After Los Angeles and Chicago and even the New York/New Jersey Port Authority seemed to be at the very least sampling The Boring Company Kool Aid, it’s so damn refreshing to hear someone approach the hype machine with at least a little bit of healthy skepticism. Tesla is an unrealistic fantasy company and Elon is a corperate/Gov puppet. I don't see the puppet part considering he is under investigation for smoking pot on Joe Rogan's pod cast, his twitter posts etc.. don't think he cares about a lot to be honest. He seems like he was very passionate about Space-X and the well being of the equipment and then eventual crew that he will be responsible for. He pulled the Joe Rogan stunt intentionally to manipulate the stock price. I don't know anything about the investigation. All I know is they set that up to manipulate the stock price. What is your understanding of the investigation? Well he holds a secret clearance (which isn't hard to get) but is pretty easy to lose, I have had mine renewed 2 times in the past 19 years. It just shows there is a divide between the state and fed when it comes to smoking pot that is for sure. Do you work in affiliation with the military industrial complex? Do you really expect a double naught spy to reveal himself on KCSR? This is just a front. He's really part of the Canadian M.I.B.